At Tribe, we believe your values can drive value. Sitting alongside the thematic areas of change you wish to see, your values help define the breadth and depth of that change. Working with you to identify them, and using the United Nations Sustainable Development Goals (UN SDGs) as the impact lens, we create, with you, your ImpactDNA™. This marker is unique to you and helps us craft an approach to your wealth management that reflects what you care about and embraces investment approaches that help deliver the change you want to see. This is a pioneering new approach to wealth management for those who truly seek to achieve a greater level of impact with their wealth, in their lifetime. Working within the main asset classes and securities, responsible investing covers a range of activities from exclusion/negative screening, through themes (cleantech, water, etc. ), corporate engagement, to best-in-class/positive screening. The UN established the Principles for Responsible Investing in order to promote this movement. Defined as investments made with the intention to generate social/environmental impact alongside a financial return. The term emerged in 2007. Impact investing focuses on addressing major social and/or environmental challenges whilst generating financial returns. Impact investing can be applied as a lens across an entire portfolio. This may be in fixed income community loan funds or highly targeted environmental private equity funds. Impact investing is often a way to express personal values/missions through investment decisions – using the power of business to solve social and environmental problems. Social Investments are defined as “the provision and use of repayable finance to generate social as well as financial returns. Social investment may occur in a variety of forms such as loans, equity and bonds. We go beyond negative screening and ESG assessment to look at the true impact of each investment within a portfolio. We do this using our own unique approach, the AMI framework, which allows us to assess the level of impact of an investment. In analysing impact, our focus is not just on how well managed the business is, but importantly on the outcome of its products and services. We look at the Additionality, Materiality and Intentionality of each product or solution alongside traditional measures of organisational effectiveness. This gives us a unique view of a business’s impact. We then construct diversified and balanced portfolios across all asset classes and a range of investment opportunities. We believe passionately in a bespoke approach to portfolio construction. This is one that considers your financial risk tolerance, combined with a thorough understanding of your personal values and beliefs – your ImpactDNA™. At Tribe, we want to infuse your wealth with a sense of purpose. We believe in deeply engaging with your personal values so that your wealth becomes an extension of who you are. 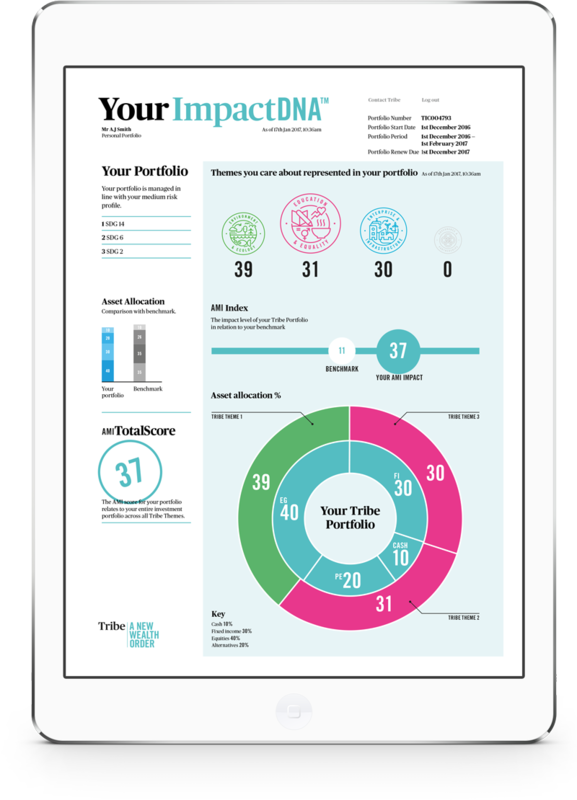 Through our impact assessment and reporting, you can track the performance of your Tribe portfolio. It’s here that you will see not just your financial progress, but also the positive and sustainable impact that your wealth is having on the world around you. Each update is another chapter in your story. Our fees are clear and transparent. We charge an all-inclusive fee depending on the total value of your assets. We do not charge per transaction executed, rather we make changes to your portfolio as and when we feel necessary. We do not accept third party fees or payments.